With my review commitments once again on track (for a couple of weeks), I've had time to sit down and dedicate my reading to next batch of titles in the Great Self-Published Fantasy Blog-off. To be as fair and consistent as possible with my evaluation, I didn't want to just sneak these in, one at a time, between other titles. My moods and tastes do change regularly, depending on what I've just read (and whether or not I enjoyed it), so ensuring a measure of consistency was key for me in my overall approach. Once again, I committed to reading the first 50 pages (at a minimum) of each title, with the hope that one or more books in the batch would be strong enough to keep me reading right through the end. This time around there were 2 titles that kept me engaged to the end, and a third that took me beyond the initial 50 pages, but which faltered before the end. While this had enough potential to keep me reading beyond the initial 50 pages, the story ultimately developed too slowly for me to hang on through to the end. It actually reads a lot like an old Dragonlance or Forgotten realms novel - which I likely would have devoured 15-20 years ago, but the experience of a few aborted rereads have proven to me that my tastes have changed since then. The characters here are interesting, although I found the boys to be largely indistinguishable from one another. As for the setting and world-building, they’re just a touch above average, with a few nice flourishes that made me smile and nod along the way. I liked the glimpses of magic and mythology, with just enough mystery to make me want to know more. Like I said, though, it all came down to pacing for me. There was just too much introduction, and not enough action. It’s clear that Grinsfelder is setting up a few different story arcs of adventurous quests and heroic destiny, but it just took too long to get going. Unfortunately, nothing about this one gave me enough motivation to continue beyond my initial reading. For starters, I found the storytelling somewhat weak, lacking any kind of stylistic flourishes that would serve to draw a reader in. In many places it reads like a screenplay, merely basic scene and set direction, without detail. Even the dialogue – which might have otherwise helped to redeem the narration – felt thin and emotionless. The other issue for me is that I genuinely disliked Rat, the main character. Don’t get me wrong, cowards and scoundrels can make for fantastic protagonists – just as Mark Lawrence or Lee Battersby – but they need a strong personality and a hook to make the reader care. I just didn’t get that here. Rat just sort exists, taking up space on the page, and following along in the wake of others. I was hoping for a bait-and-switch, where Rat would meet up with the real hero and assume the role of sidekick, but it didn’t look like that was happening. As for plot and pacing, I honestly wasn’t sure what the story was about or where it was going. It just seemed like a bunch of scenes or vignettes put together, without a clear idea of how they interconnect or what the larger story might be. This is a very odd book to talk about - on the surface, it just shouldn’t work. We have multiple narrators, between whom we switch more for narrative effect than the needs of the story. We have a distinct coming-of-age story (which I’ve long since grown tired of), where the hero hides behind the persona of who he’d like to be. We have storytelling within the story, a kind of intrusive info-dumping that interferes with the forward progression of the plot. Finally, we have a plot that seems to wander without a clear direction for much of the book, before suddenly finding its direction and racing to a climax. Despite all that, it worked. The narrative was strong – from the language, to the dialogue, to the imagery. Brink isn’t afraid to write lengthy paragraphs and scenes, to take his time setting things up, and to show us his world. That, to me, is engaging. It draws me in, makes me read a bit more closely, and gives the appearance of depth (which, it must be said, is not merely appearance). 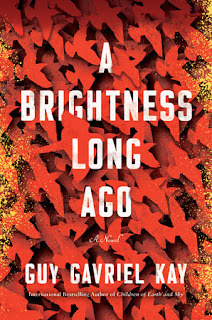 As for the characters, the hardest aspect of writing a novel is to encourage that immediate emotional connection, to draw readers in, and make them care - and Brink does that very well. I liked Billy from the first time we met. He interested me, intrigued me, and made me want to know more about him. There was this welcome duality to him that allowed him to play the hero very well, even as he grew into the role. It’s less a coming-of-age tale and more a story of self-discovery. There’s a lot of imagination and fantasy flourishes here as well that really caught my attention. Even small, throw-away scenes like the dream of monsters inside the tavern are full of fantastic detail, allowing you to not just ‘see’ the danger but ‘feel’ it as well. That element of storytelling within the story really won me over. It allows for things to get a bit wild, a bit over-the-top, without dragging down the credibility of the entire story. We expect people to embellish their tales of heroism because we want to be entertained as much as we want to be informed, and Brink clearly understands that. It’s not just mindless heroism and adventure, however. There’s also a heart to the novel, a very self-aware sort of appreciation for humanity and the horrors of war. Towards the end of the story, Billy stands before an advancing army of swamp monsters and asks himself, “How monstrous can they be if they mourn?” It’s a good question, and it leads into the final evolution of Wil (the hero) coming to terms with being Billy (the boy). 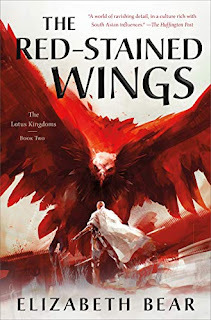 Sure, I would have liked a little more world building, and I would have liked more of a sense of the wider world, but those are minor quibbles to be resolved in a second book. All-in-all, Tarnish is a solid tale, a classic sort of heroic adventure that’s really pulls all the elements together in a satisfying resolution. 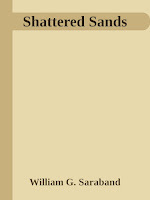 Shattered Sands distinguished itself for me from the first page. What could have been a fairly standard negotiation about slaves is turned into an intriguing bit of character establishment with a clever young woman and the stuttering Vizier who owns her. There’s so much personality in the first few scenes, that the shock of discovering he is just 19 years old really works. 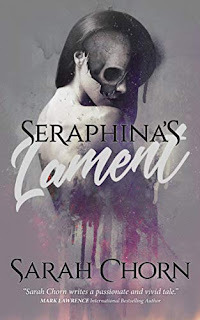 Similarly, our back-alley introduction to Sabra, where roles are reversed and she must fend off the advances of a male prostitute with her hidden knife, is as intriguing as it is deliberately unsettling. Saraband immediately tops that, however, barely allowing her to find solace in her home full of “holes and fissures” before engulfing it in green flames and nailing her alchemist father to the wall in a pentagram position. The world-building here is solid, especially in terms of establishing a culture, its traditions, and its rules. What we have here is a very Middle Eastern sort of world, complete with bazaars and brothels, as well as palaces and palanquins. It’s a cruel world, one where public appearances mean everything, and one where political posturing extends from the amphitheatre of College to the intimacy of the bedroom. The history of the world is revealed in dribs and drabs, through conversations and idle thoughts. It definitely has the feel of a desert culture, but that's where the comparisons to the Middle East end - the politics and religions here are Saraband's own. There’s no info dumping here, just a lot of assumptions on the author's part that we’ll pay attention and learn as we go. For instance, it isn’t until we’re halfway through that we learn of the thousand-year-old Rattling War, so called because of the sound made by the skeletons marching, but it proves to be a pivotal revelation of magic’s true power. As such, when we witness Sabra’s momentous encounter with a Djinn, complete with deadly scorpions and murderous magic, it’s less of a shock and more of a welcome revelation. 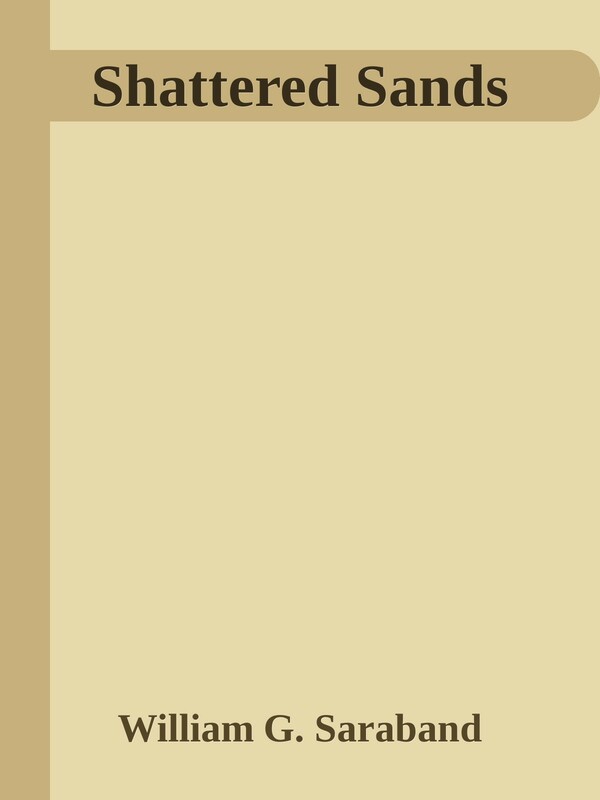 If there’s any drawback to Shattered Sands it’s that the story is so ugly, so violent, and so cruel. There’s not a lot of light or happiness to be found here, and very little humour to balance out the drama. It makes for rather heavy reading at times, and may challenge some readers, but the storytelling, the characters, and the imagination of it all kept me reading through to the end. This wasn’t a bad read, I just didn’t find it offered me anything interesting or new. The story itself isn’t quite clichéd, but feels as if it followed a checklist of fantasy tropes to piece it together. Too much of it just felt overly familiar, without any narrative nuances or character strengths to differentiate it. Maybe there’s more character development later in the book but, from what I read, they seemed to be figures picked to fit those tropes. I didn’t really find that we got to know any of them especially well, and while I was sympathetic to Tarn’s plight, I didn’t empathize with him. Similarly, Tulathia could have been an interesting character – I generally like witches in my epic fantasy – but she didn’t come across as having the kind personality that would distinguish her or make her memorable. There did seem to be some imagination here, and some glimpses of an interesting world, but not enough to hold my interest. CONCLUSION: Like I said at the start, this time around a pair of titles kept me reading right through to the end. As to which one wins out for me, I have to give Shattered Sands the (slight) edge. While I may have enjoyed Tarnish more, there was just more technical skill and imagination displayed in Shattered Sands. Both are solid reads that I'd recommend without reservation, but if I were to look forward to a sequel, it would definitely be to Shattered Sands. Someone needs to give Shattered Sands a cover then. 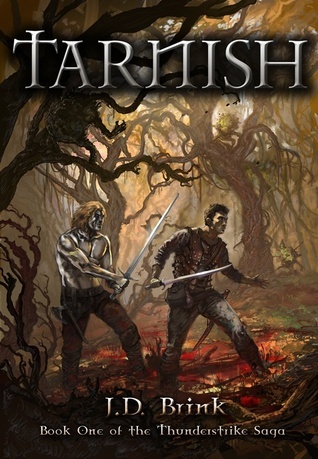 I would've picked up Tarnish first just for the cover. It's laudable, though, that Bob gave Shattered Sands equal consideration despite it's lack of a real cover, and also speaks well of the book. What's even more impressive is that English isn't his first language. Reading the book, you would have no idea. Wow, thanks for the lovely review Bob! I wasn't that optimistic, with english not being my native language and with the lack of a proper cover, so this sure made my day (week, possibly?). You found a couple of really good sounding books here. Shattered Sands sounds very interesting. I also need to do an update post so this is a very timely reminder. I would probably pick Shattered Sands out of the bunch. I'm so curious to see how the whole Blog-off ends up! Bob, thanks for the great review, and glad my somewhat experimental approach ultimately worked for you. :) And thanks again for taking the time to participate in this Blog-Off!